Susan Hamovitch is an independent film maker living in Brooklyn, New York. 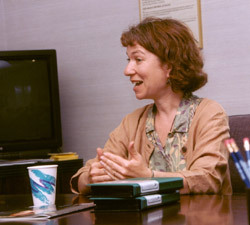 She has produced several programs for public television, including her short, On the Road to Choice. She holds degrees from the University of Chicago and Brooklyn College, and teaches courses in video at New School University. Scott Sinkler has worked for some of the today's acclaimed documentary filmmakers, including Charles Atlas and the late Marlon Riggs, as well as on several series for PBS station, WNET. Among Spiro Lampros's credits: West 47th Street, a landmark cinema verite documentary; Compassion in Exile, a documentary about the Dalai Lama by Mickey Lemle, which was nominated for three Emmys; and the award-winning The Shot Heard Round the World, by Christine Choy.